A Thursday I’d like to forget. It all started out like any other day. Jada has been driving me crazy for weeks to take her fishing before the weather got bad. One advantage of home-schooling is the flexibility in schedule. After getting permission from the teacher (Mom) we were headed for a pond close to home. I had a couple other things to do so I made list. 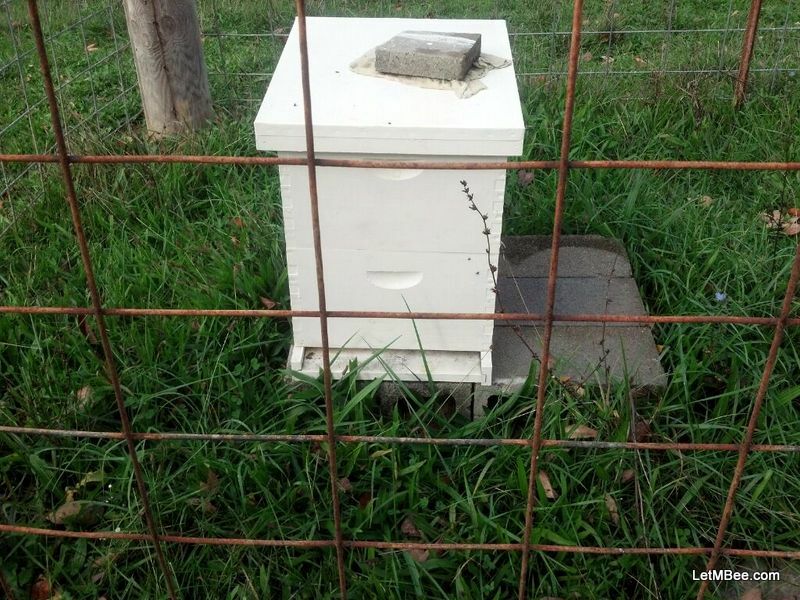 On the way home from fishing check in on a new beekeepers hive to make sure they were ready for winter. Go to a previous mentors place and assist him in winter preparations. Speak to a Garden Club about bees at 7 p.m. Pretty much a typical day off. I had no reason to think that the day was headed for the toilet, but what fun would that it be to know you were going to have a bad day. It takes the pain of living through it to understand just how lucky you are on the good days. Jada and I trying our best to catch fish. I should have known early. 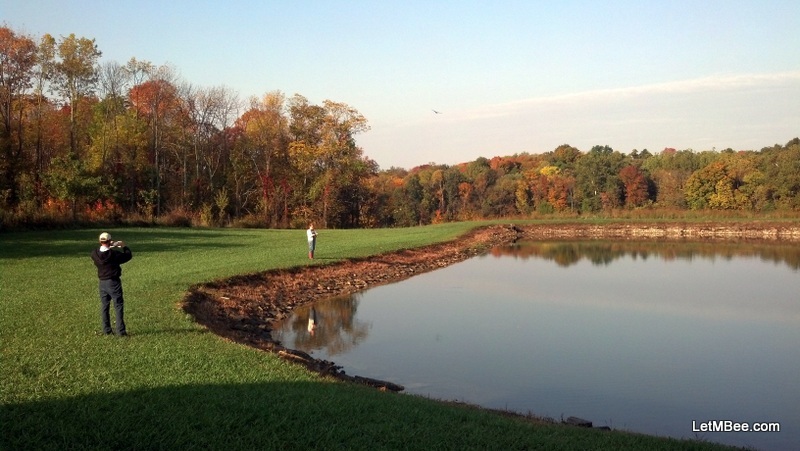 We went to my cousin’s pond which is normally pretty productive. It is one of the reasons I like to take Jada there. Taking kids fishing is a lot more fun for them (and me) when they are catching fish. I have to give Jada credit she fished hard and didn’t get discouraged, but after several hours we threw in the towel with only two small bluegill to show for our efforts. Off to the next task on the list. 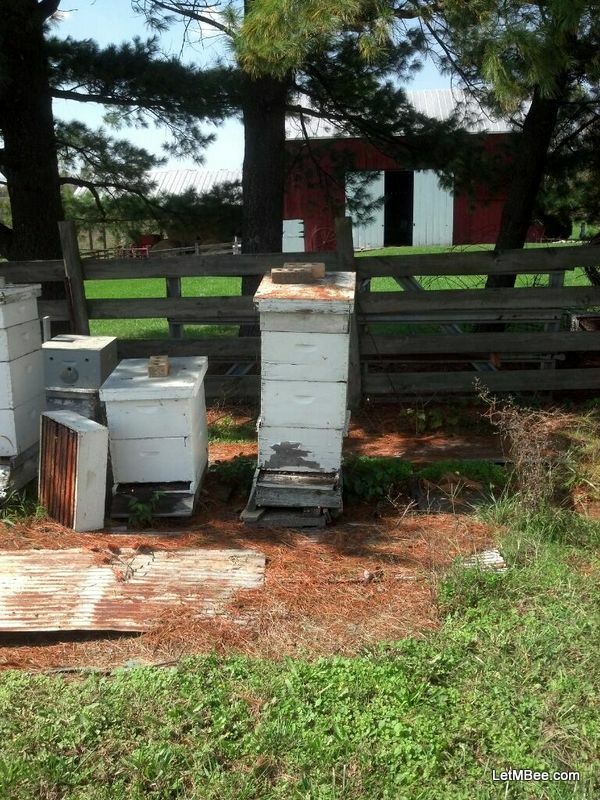 This hive is in a pasture. It is protected from the goats, sheep, and cattle by some panel fencing. On our way home we stopped at onto do e of my wife’s friend Mrs. V. This year I gave her a swarm trap full of bees. They were from a trapping spot that has consistently given me small swarms. Initially I was concerned that they would not make it, but they have built up considerably this summer and are likely to overwinter. They were minimally inspected by removing the top and inner covers and looking in on the bees. Everything looked pretty good. Perhaps this day wasn’t going to be bad after all. Hahahahaha.. Think again. Off to the next task. This is the hive that needed attention. The bottom deep replaced and the hive was levelled. Mr. S has been a bee mentor to me. Recently he was diagnosed with a condition that is making it harder for him to perform some beekeeping tasks. He asked if I would come assist him with a couple things and I gladly agreed. I arrived at his house sometime early in the afternoon. The condition of some of his wooden-ware had gotten pretty bad. There were several boxes that need to be replaced soon, but one of them needed to be replaced immediately because the corners were beginning to separate. Unfortunately it was the bottom box of a three deep behemoth and was clearly the most active hive there. What started out as a nice calm autumn day had turned into a pretty windy one with a definite chill in the air. I never like working bees on bad days, but this needed to be done immediately. I dissembled the hive as quickly as possible. The wooden stand and the bottom board were replaced along with the bottom deep. Several of the frames came apart on me because they were missing a very important nail. (See Getting Framed don’t let this happen to you!!!) I was able to get them back together and back in the hive. It was an ugly hive manipulation with some really angry bees, but I got it done and the bees went back to work. I visited with Mr. S for a while and headed for home. That’s when things took a turn for the worse. Mr. S lives about 35 or 40 minutes south of me. About half way home my car began making a bunch of noise and the wheel began to jerk back and forth in my hand. I pulled over to the side of the road to give it a look, but could see nothing out of the ordinary. Luckily I knew one of the local land owners. I limped it to their place and they said I could leave it overnight. It was 4:45 and I still had to make it to the Garden Club Meeting by 7:00. I called Holly (the greatest woman in the world) and she came and to get me. By the time she picked me up and we made it home I had just about enough time to change my clothes and grab a camera. I was off to the Garden Club meeting to speak about bees. This is The Beekeepers Year. It does say to feed bees on it, but around the border there is a picture of the progression of blooms from the midwest. I had only found out about this meeting the night before. The host, a friend since high-school, had been scrambling for someone to speak. I had been racking my brain all day trying to come up with my program. 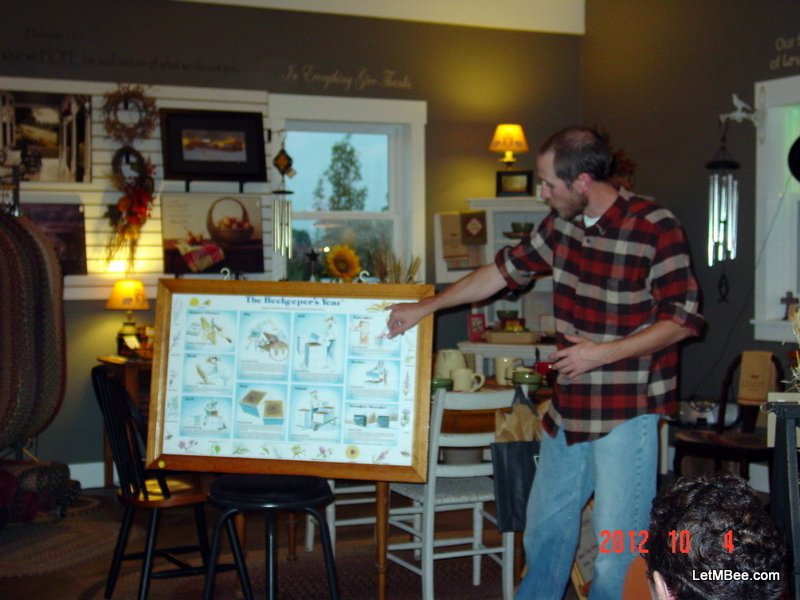 At about 6:40 just prior to leaving the house I decided on a topic that would relate to gardening and beekeeping alike. 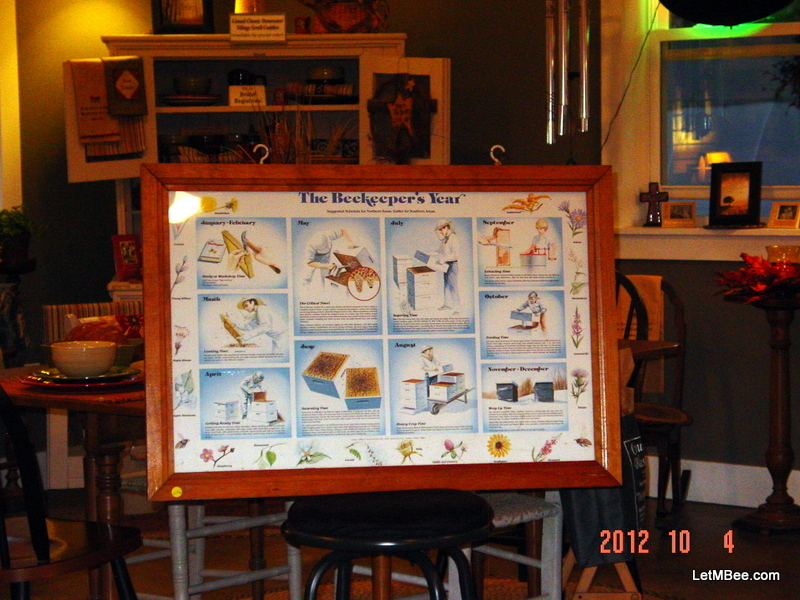 Jada and I arrived at 6:58 with one of my favourite framed bee posters – The Bee Keeper’s Year. After some brief introductory mumbo jumbo I asked the group if they were in the gardening club for social reasons or if they were seriously committed to gardening. Talking phenology: pointing to the asters and golden rod, the last blooms of the season. Everyone agreed they were pretty hard-core gardeners, so I launched into a short presentation about Phenology and how beekeeping had made me much more aware of the progressions of flower blooms, the seasons, and the natural world, making me a much more aware gardener. We then moved to what I was doing with treatment free beekeeping and the success I was having right here in mono-crop hell. As with every group I have spoken to, there were questions about the plight of bees. I told them, that bees were in trouble worldwide, but mine were doing just fine. I answered questions for what seemed like forever. At the time I didn’t know if they were interested or just being nice. I left the meeting and spoke with the host’s husband, while Jada and their kids played a while. After the group departed the host told me that the Garden Club members enjoyed my presentation and were asking about books on phenology. Defiantly something for me to think about for future programs. I departed the Garden Club meeting. It was 8:40 and Jada, my photographer, had to be home and in bed by 9:00. We made it with just enough time for her to get her teeth brush and make it to bed…. 10 minutes late. 🙁 I was in the dog house as usual. Darn this day! Hope your Thursday went better than mine. I spent half the day Friday working on the car and still didn’t get it fixed. Hopefully this week goes better. This entry was posted in What's going on.. and tagged phenology. Bookmark the permalink. 2 Responses to A Thursday I’d like to forget. Sounds like a tough day, and congrats on your talk! We have our own reducing of hives to do too. Have you gotten the car fixed? I will be back in business soon. Been getting hives ready for winter.